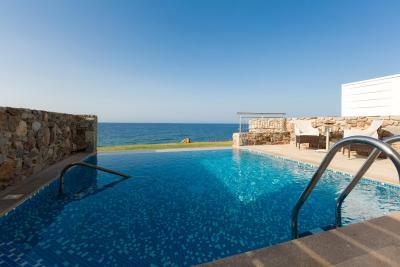 Lock in a great price for The Royal Blue a Luxury Beach Resort – rated 8.8 by recent guests! When we where there, the hotel was fully booked. But it stays calm and quiet! Our original room had an issue and they immediately gave us an upgraded room. Breakfast was better than I have seen anywhere else and the staff was friendly and professional. The location is also great to visit Rethymon and Chania. Everything was better than expected. The facilities like the pools, dining halls etc are good. We enjoyed the upgrade to a sea view room. Finding out it was a delayed wedding anniversary trip treated us to a bottle of wine and cake. Rooms were lovely, clean and comfortable and well-equipped. Pool area very relaxing with plenty of sunbeds. Staff very welcoming. Beautiful resort and beach and great to be able to swim in the sea. 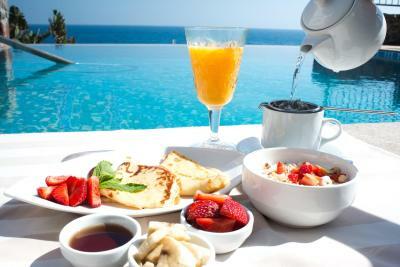 The hotel accommodation was luxurious, the setting was beautiful, the food was superb and the service was excellent. We had a wonderful experience here. The property was well presented and our room had a lovely sea view as expected. The room was cleaned to a good standard. Room service was very efficient. There was a local tourist train to take you to Panormos village taking about 10 minutes where the local tavernas were very reasonably priced. We hired a car which is probably the best way to see the Island. 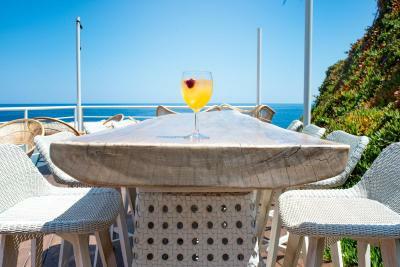 Les mignardises et le raki en accueil dans la chambre, la gentillesse et la serviabilité du personnel, les serviettes de plage extra-douces et design, le large choix de plats pour le room-service, la possibilité de privatiser la piscine chauffée du spa pour un prix abordable, le savon exfoliant dans les chambres (super crémeux! ), les beds chauffants devant le sauna. The Royal Blue a Luxury Beach Resort This rating is a reflection of how the property compares to the industry standard when it comes to price, facilities and services available. It's based on a self-evaluation by the property. Use this rating to help choose your stay! 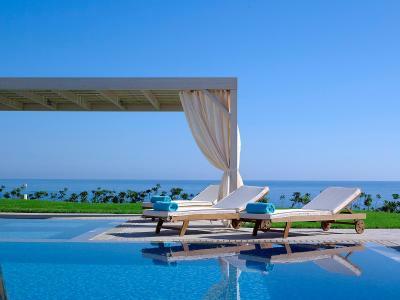 The 5-star The Royal Blue a Luxury Beach Resort is a tranquil exclusive resort on the northern coast of Crete. 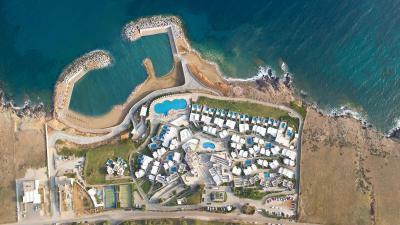 A private bay, 38 pools, 4 restaurants and 4 bars are found within its 70-acre premises. Free WiFi is available throughout. The Royal Blue a Luxury Beach Resort’s superior rooms are stylishly decorated in warm and soothing tones and offer sea or garden views. They all feature flat-screen TVs, and spacious bathrooms with 2 sinks. 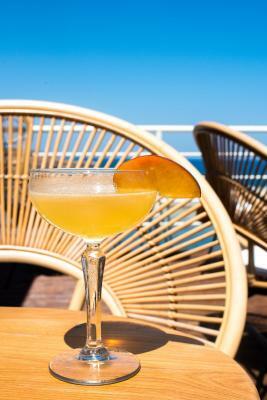 Upon arrival, all guests are greeted with a welcome drink. 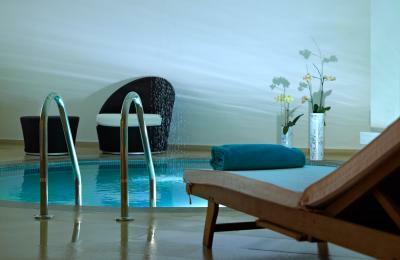 The Pure Senses Spa offers massage, hydrotherapies, facial and body treatments. 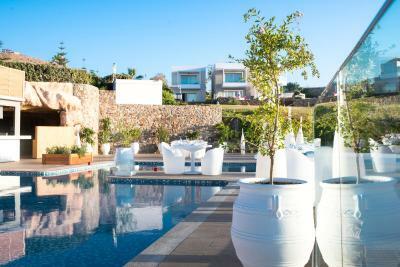 Guests will find a tennis court, as well as mini golf and soccer courts within the premises. Colorful gardens extend throughout the resort, while natural stone has been used to blend harmoniously with the surroundings. 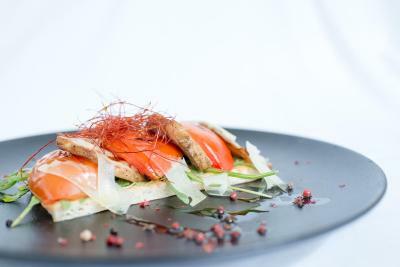 Gourmet enthusiasts will savor the fresh approach to food and cooking styles from China and Japan or indulge in authentic Greek, Italian, Spanish and European flavors. Alternatively, experiment with Indian sensations or sample the purity of seafood or meat; the choice is varied and diverse. 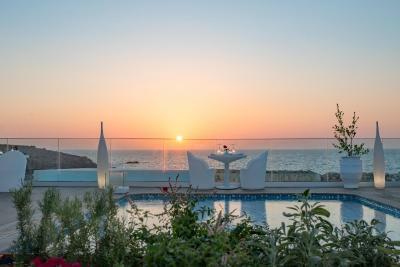 Only 14 mi from Rethymnon and 34 mi from Heraklion, adults-only The Royal Blue a Luxury Beach Resort offers easy access to both Chania and Heraklion airports. 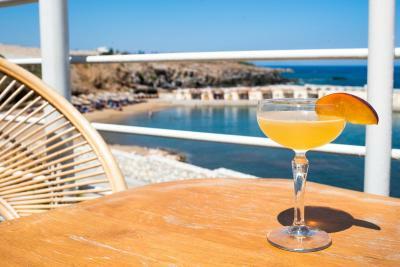 When would you like to stay at The Royal Blue a Luxury Beach Resort? Waterfront suite are located on the 1st floor of a two-story building. 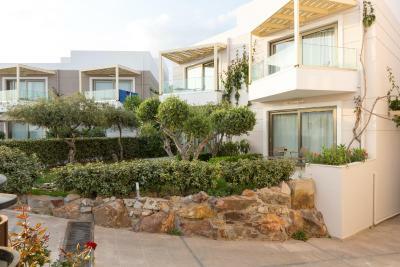 Each has an elegant living room which opens to a balcony and a bedroom with sea view. 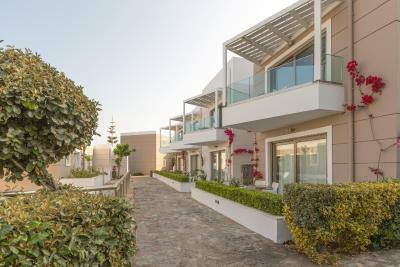 Featuring a private pool with terrace, this 2-level villa has a bedroom with private bathroom on the second floor, and a living area and a second bathroom on the ground floor. This waterfront suite opens to a sea-view terrace with a private pool and separate children’s pool. 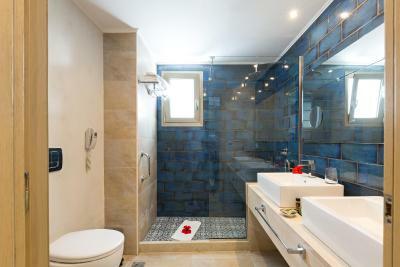 It features a spacious living room and bedroom with marble bathroom. 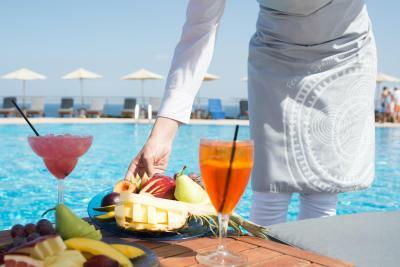 On a separate floor, it has a gym, sauna, indoor pool and a fully equipped kitchen with private chef. 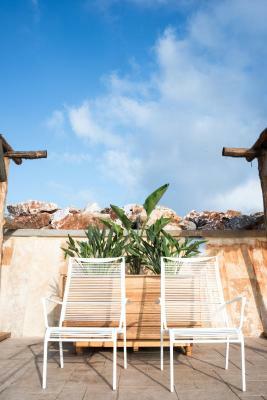 There is also parking space, BBQ facilities, outdoor furniture, sun beds and umbrellas. Please note that there is a separate entrance for the staff and buttler service upon request. 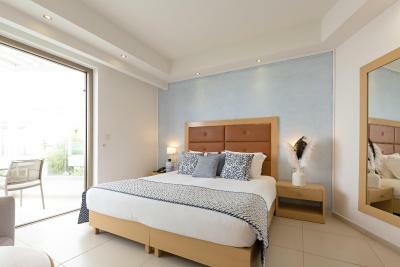 Located on the ground floor, this suite has a private pool with sun loungers and a spacious, furnished terrace. 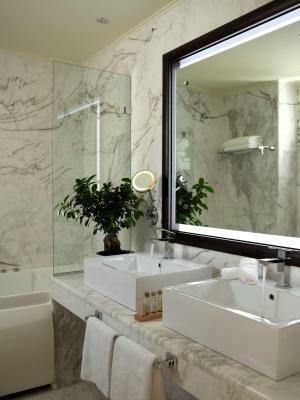 The luxurious marble bathroom comes with bathtub and shower. 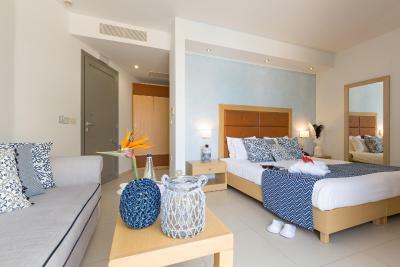 This double room features a balcony, mini-bar and private pool. This villa has a balcony, tile/marble floor and mini-bar. This suite features a washing machine, dining area and sauna. 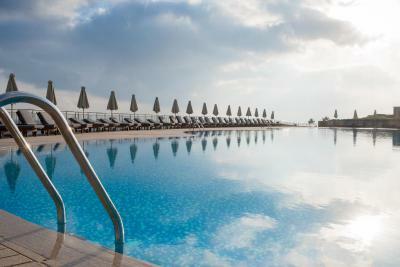 The Sensimar Royal’s superior rooms are stylishly decorated in warm and soothing tones and offer sea or garden views. They all feature flat-screen TVs, and spacious bathrooms with 2 wash basins. 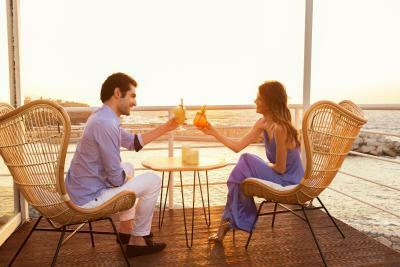 Upon arrival, all guests are greeted with a welcome drink the renowned Cretan hospitality, which harmonically combines local tradition and all modern trends. 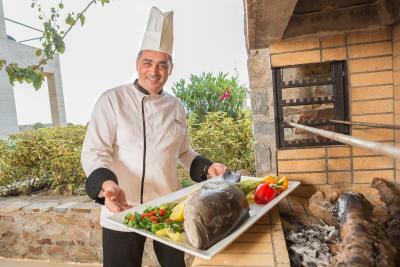 Gourmet enthusiasts will savor the fresh approach to food and cooking styles and indulge in authentic Greek and European flavors. Alternatively, experiment with Asian sensations or sample the purity of seafood or meat; the choice is varied and diverse. MUST DO: 1. 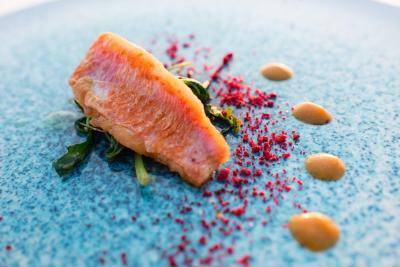 Enjoy an unforgettable Private Dining Experience at your preferred spot in the hotel grounds!. 2. Live the unique feeling of a Mystical Outdoor Massage of Cave Experience by Pure Senses Spa. 3. Embark on a"Gastronomic Journey" by enjoying your dinner or lunch in all of the 4 restaurants. 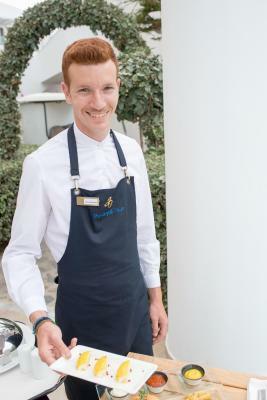 House Rules The Royal Blue a Luxury Beach Resort takes special requests – add in the next step! The Royal Blue a Luxury Beach Resort accepts these cards and reserves the right to temporarily hold an amount prior to arrival. The reception staff, though friendly, need a lot more of training. Had to wait for a long time, just to complete the check in formalities. Rooms need better maintenance. Room 404 was a little noisey due to kitchen staff being located behind our room which woke us up early. We stayed bed and breakfast which was excellent however we decided we would probably eat at hotel restaurant one night they wanted to charge €40 each ! not including drinks !. You can get a great meal in Panormos village for €30 for 2 people including a starter , 0.5 L carafe of wine and a large beer. Prices extortionate in hotel. We also stocked our room fridge with wine and beer etc fom supermarket which is a few minutes walk. Lovely facilities, great staff, great food! Not keen on food in restaurant - some food not very warm hence seemed over-priced for half-board. Much preferred the a la Carte restaurant which was fantastic quality.